A collection of interesting statistics on marriages and weddings within Australia taken from the Australian Bureau of Statistics. The number of marriages are increasing! In 2008, there were 118,756 registered marriages in Australia. This is the highest number of marriages registered in a single year since 1989 when 117,176 marriages were registered and continues the relatively steady increase in marriages since 2001. Although the number of marriages has returned to a level comparable with those of 20 years ago, the population has increased over this time. As a result, the crude marriage rate is lower than it was 20 years ago. In 2008, the crude marriage rate was 5.5 marriages per 1,000 estimated resident population, compared with 7.0 marriages per 1,000 estimated resident population in 1989. We are getting married older! The median age of people married in 2008 was 31.6 years for males and 29.3 years for females. From 1989 to 2006 the median age at marriage increased by 3.64 years for males and 3.58 years for females. In 1989 the highest age-specific marriage rate for males was in the 25-29 year age group (53.3 per 1,000 males), however for females, the highest rate was amongst the 20-24 year age group (68.4 per 1,000 females). Most marriages are first time marriages! In 2008, 78.2% of people married had not been married previously, continuing the general upward trend observed since 2001. For males, this applied to 77.3% of all marriages, with a further 1.6% of males having been widowed, and 21.1% having been divorced. For females, 79.0% had not been previously married, with a further 1.8% having been widowed, and 19.2% having been divorced. Marriages in which neither party had previously been married made up 69.8% f all marriages in 2008, while a further 16.8% were first marriages for one partner. The remaining 13.4% of marriages were remarriages for both partners. Since 1989, the number of widows/widowers remarrying has been steadily decreasing while marriages of people who were previously divorced has remained relatively stable for the last few years. Civil marriages have outnumbered religious ceremonies since 1999 when 51.3% of all marriages were performed by civil celebrants. In 2008, the trend toward civil ceremonies continued, with 65.0% of marriages performed by civil celebrants. Of the 41,545 marriages performed by ministers of religion in 2008, the most common rites used were Catholic (33.5%) followed by Anglican (17.7%). In 2008, 59.4% of marriages were of couples where both parties were born in Australia. A further 10.5% of marriages were of parties born in the same overseas country, and 30.0% marriages were of males and females born in different countries. The median age of males and females born in Australia who married in 2008 was 30.8 years and 28.7 years respectively. Males born in Italy and Greece had the highest median age at marriage, 46.0 years and 43.3 years respectively. In contrast, males born in China had the lowest median age at marriage (27.3 years). For females, those born in Italy had the highest median age at marriage (43.5 years) followed by those born in Greece (37.0 years). In contrast, females born in Lebanon had the lowest median age at marriage (24.9 years). Couples are living together prior to getting married! Of the 118,756 couples who registered a marriage in 2008, 77.7% indicated that they had lived together prior to registering their marriage. These couples tended to be slightly older than all people getting married. In 2008, the median age of males who lived with their wife before marriage was 32.0 years, compared with 31.6 years for all males. Similarly, the median age of females who lived with their husbands before getting married was 29.7 years, compared with 29.3 years for all females. The most popular month for weddings is November & Saturday the most popular day! In 2008, the most popular month for marriages was November, with 15,109 (12.7%) marriages celebrated in this month. March followed with 14,128 (11.9%) marriages. July was the least popular month for weddings, with only 5,008 (4.2%) of marriages taking place in that month. 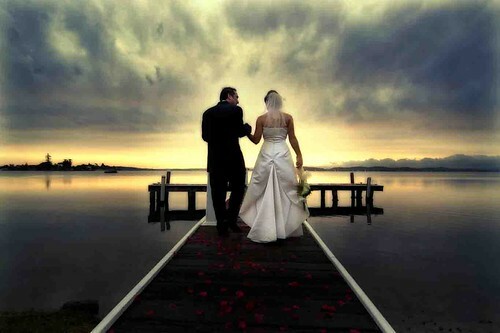 New South Wales leads the way for marriages! In 2008, the greatest increase in the number of marriages registered was in New South Wales (up by 1155, 3.0%) and Queensland (995, 3.9%). Both South Australia and Tasmania decreased by 49 (0.6%) and 176 (3.8%) respectively. Queensland recorded the highest crude marriage rate in 2008 (6.2 marriages per 1,000 estimated population), whilst the Northern Territory had the lowest crude marriage rate, with 4.3 marriages per 1,000 estimated population. Marriages performed by ministers of religion as a proportion of all marriages in 2008 were highest in New South Wales and lowest in Tasmania (39.5% and 29.5% respectively). In 2008, the proportion of marriages where couples lived together prior to marriage was lowest in New South Wales (69.9%) and highest in Tasmania (86.4%).